Michael Kelland John Hutchence was born on the 22nd January 1960 at the Mater Misericordiae Hospital, North Sydney, NSW, Australia. 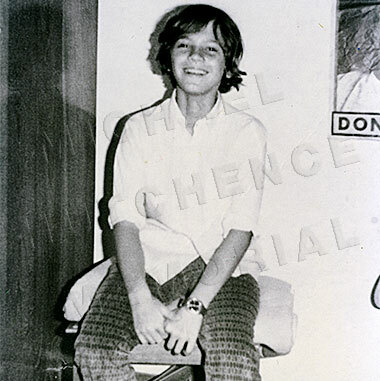 His mother Patricia and I were then living at the Hutchence family residence at Howell Avenue, Lane Cove, Sydney, a nice comfortable English style cottage which my mother and father designed and built back in 1926. My dad was a sea captain and he and my mother moved from England to Australia in 1922 because dad had joined an Australian shipping line and needed to be based in Sydney. My sister, Iris Croy, was born in England and was a babe in arms when my parents settled in Sydney. So the house in Lane Cove held many memories when Patricia and I moved there soon after we were married in 1959. It had become vacant because my dear dad had passed away in 1957 and my kind and loving mother had married again at the ripe young age of sixty five and moved into her new husband’s home at Mona Vale on the beaches north of Sydney. To have my first born child, and a boy at that, joining Patricia and I at the old family home meant a lot to me. 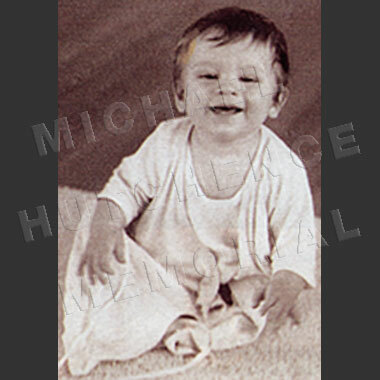 Michael was an adorable baby with a sweet nature and just giggled and smiled and was no trouble at all. Thankfully we have happy memories to warm our hearts and souls. When he was four years of age we moved to Hong Kong as I had accepted a position there with a large Australian trading company. So, with Rhett his brother who was two years old, Tina my step daughter then fifteen years old and Patricia and I we moved and settled into a nice life style in a large apartment in Old Peak Road, at what is known as mid-levels which means about mid way up the mountain which forms the backdrop to Hong Kong and provides residents there with grand views of the busy glittering harbour. 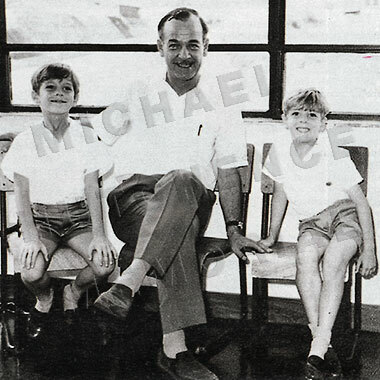 Michael was enrolled at the kindergarten at Glenealy School when he turned five years old and Rhett followed when he reached the school entry age. After finishing kindergarten school Michael and Rhett went to Beacon Hill Primary School as we had moved into a house in Kowloon Tong which was close to that school. We had a nice park right behind our back gate and the boys loved playing there. Apart from joining the boy scouts Michael developed his swimming skills and we had him trained at one of the social clubs by an ex olympic swimmer and he became something of a champion at swimming winning many races and medals. His brother Rhett was also a good swimmer and also won medals – in fact I can remember when Michael, Rhett and dad won the father and son relay race one year at the USRC club – that was quite an event for us. But as luck would have it Michael was playing in the park behind our house one day when he had a bad fall and broke his right arm near the elbow and that finished what may have been a very promising swimming career. About this time we noticed that he had taken quite an interest in poetry and was also showing some musical ability. He did his very first solo song for a toy company in Hong Kong who wanted a young voice to record on a tape in a toy – so Michael actually started his singing career in 1968 when he was eight. After eight years in Hong Kong we returned to Sydney in 1972 and bought a house in Belrose, a garden suburb on a plateau some twenty kilometers outside Sydney and not far from the northern beaches. I was often amused by Michael calling Belrose “sausage hill” because of all the weekend barbecues that went on there. Soon after settling into our new home we bought Michael and Rhett mini trail bikes and I spent most weekends hauling bikes and boys to various bike riding locations. And of course mum and dad were also kept busy on the weekends running the boys to and from the beaches. It was in Belrose that Michael started attending Killarney Heights High School where one day he met Andrew Farriss and they became good friends. 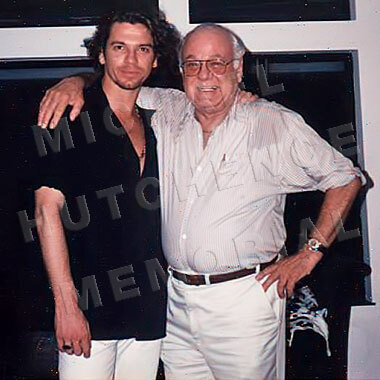 In fact the Farriss and Hutchence families became friendly and soon we were hearing a lot of music coming out of bedrooms and much discussion about bands and rock and roll. The Farriss brothers Andrew, Tim and Jon along with Michael started making music in our garages and not long after, Kirk Pengilly and Garry Gary Beers joined them and almost out of nowhere we were hearing some pretty good rock and roll sounds. Along the way the boys had transferred to a new school, Davidson High at Belrose and it was here that they started to get serious about forming a real band. Soon they were playing gigs at small clubs and other venues under the name of The Farriss Brothers and that was the start of an unbelievable trail of events which led Michael and the other guys into finishing their schooling and playing at bigger gigs around Sydney and its far flung suburbs. Soon Michael and Andrew were writing music – Andrew putting the music notes together and Michael writing the lyrics. Michael was starting to get his photo in the papers and magazines and The Farriss Brothers band was very much in demand. Soon they were to drive across Australia in an old station waggon they had bought – through the desert and all the way across to Perth in Western Australia where the Farriss parents had relocated. Here they worked very hard rehearsing, polishing up their act and writing more music. Michael and the boys then played gigs in some very rough areas in the remote mining towns of the North West. Michael often told me how he had found that experience so valuable in making him more mature and learning about what it meant to be truly dedicated to his craft. 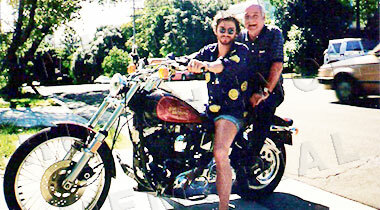 I recently found a letter he had written to me telling me how he was making about $150 a week and that he had taken out a loan for $2,000 with Andrew’s dad going guarantor to buy some extra equipment – he also asked me if I could pay a few dollars into his bank account in Sydney as things were still pretty rough financially. But by now they had conquered all of the Perth scene and decided to fly to Melbourne, Victoria, and try their luck there. Well of course they were highly successful and the media attention was becoming greater and greater with Michael being hailed as the “new voice in Rock”. Then they came back to Sydney and signed their first recording contract – from small clubs and halls Michael was now singing with the boys in large auditoriums and other venues and receiving much media attention. If there was an emerging star in Aussie rock and roll he was it – and soon they were to change their name to INXS and more recording contracts and albums followed. They had experienced unparalleled success in all of Australia and hit the top of the charts and one day Michael told me he was going to the USA with Andrew to survey and meet the right people with a view of taking on the world – USA being the first stop. I admired this wonderful spirit he showed – he was so confident and enterprising – and they did meet the right sort of people. After enduring some hard learning curves, Michael, Andrew and the rest of the band set their goals and with great spirit and tenacity Michael slowly but surely became extremely popular in the USA and Canada and later he and the band took on the UK and Europe and achieved the same success. They then spread their wings further and toured other countries such as Japan, Argentina and Brazil with wonderful results. The band was now established as one of the greatest Rock & Roll groups in the world and their sensational album KICK seemed to say it all. More recording contracts followed and it was not long before they played Wembley – Michael by now was a legend on stage and when I saw that show at Wembley I can tell everyone that I was just so proud –that was my boy up there, my son – a great rock star and musician and also a wonderful man who had weathered many ups and downs in his life but who had always hung on and got there without any pretensions – a man who always cared for others and who gave so much love especially to those who needed it most. His solo album is the best memorial we could ever have of this great son. His sad demise is something I am learning to deal with but somehow I always feel he is not far away – just out there fairly close with a smile on his face and missing us as much as we miss him. His solo album is the best memorial we could ever have of this great son – the culmination of many years of his hard and endearing work I know how he struggled over the years to get this album out into the world – the notes, the lyrics, the sound – he strived to make this album as perfect as he so deeply desired it to be – and I sincerely believe he achieved just that for I think it is indeed outstanding and I hope you too enjoy it for that is what he hoped for – your appreciation of what his voice brings forth. I would like to take this opportunity to thank Bono, Andy Gill, Danny Saber, the management and staff at V2 Records and all the other dedicated people who helped Michael to produce this exceptional album. This website is Michael's sacred site, dedicated to his memory and celebrating his life. It is a central location for all who love him and miss him to come together and pay homage to a gentle lovable spirit. It is not a record company site, nor an INXS site nor a fan's web page. This site is brought to you by Kelland & Susie Hutchence and their good friends Mario & Jacqui Ferrari and Dennis Patterson. Previously unpublished pictures of Michael plus stories about Michael from family and close friends can be found within the site. We welcome you to our beloved Michael's Memorial.